**ALL ITEMS HAVE FREE SHIPPING WITHIN THE U.S.A.
Our Original California Style Hot Pepper Sauce with added chunky pieces of garlic. The perfect combination of spice and garlic makes the perfect garlic lover's hot sauce. Some like it really HOT! Our Original California Style Hot Pepper Sauce with Habanero peppers added for those who like to add a little "fire" to their recipes. A mild spice derived from our Original California Style Hot Pepper Sauce. The perfect "secret addition" to soups, sauces, and stews. Also makes a great rub for chicken, beef and pork. For a real treat, sprinkle on your popcorn instead of salt. Get a little taste of California in a bottle. 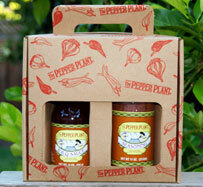 The 2 bottle gift box comes with our two California Central Coast favorites: Original and Chunky Garlic. Shipping/handling costs will be calculated during the checkout process. Give the grill master in your life our BBQ Lovers Gift Box. 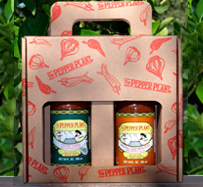 Our gift box comes with PepperPlant BBQ Sauce and our Dry Rub Seasoning derived from our Original California Style Hot Pepper Sauce. Shipping/handling costs will be calculated during the checkout process. Perfect for the PepperPlant lover. 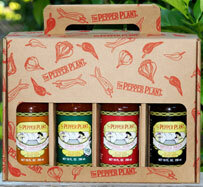 Our Gourmet Gift Box includes one each of our California Style Sauces. Get our Original, Chunky Garlic, Hot Habaneros, and Chipotle in one convenient gift box. Shipping/handling costs will be calculated during the checkout process.